In general, local content is much more popular than NPR content, with over 10 times as many pageviews. On a per story basis, local stories get a lot more mileage. When we looked at the number of individual stories that contributed to those page views there weren't 10 times as many local stories - there were only twice as many local story URL's as NPR story URL's. This means that individual NPR stories are getting a handful of views, where local stories are getting hundreds or thousands. As far as attracting new audience, we didn't see a lot of this happening with NPR stories, which is good because that content doesn't showcase the station's uniqueness. There have been some rare occasions where Google search indexing has run amok and driven large traffic to a station site based on an NPR article. In these cases the spike in traffic isn't likely to bring in a high concentration of audience that is likely to return, but it ultimately shouldn't hurt either - besides temporarily driving up bounce rate and driving down retention measures. How do I know that those users aren't likely to return? We used the Cohort reports in Google Analytics to look at twelve week audience retention trends for users who saw local content and for users who saw NPR content. 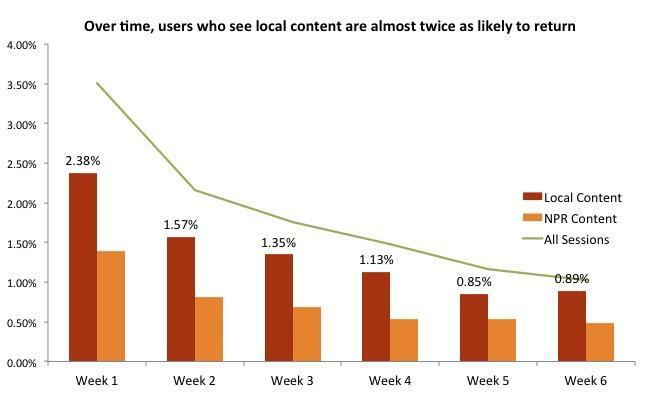 Over time we saw that users who saw locally produced stories were twice as likely to return. Average week one retention for the local content group was just under 2.4%, compared to 1.4% for the NPR content group. In both cases, this was lower than the total week one retention rate of 3.5%. We have seen in the past that streaming is more habitual than reading and these numbers support that, but reading local is more effective than NPR at helping readers to return. There also appears to be some risk in over-using NPR content. 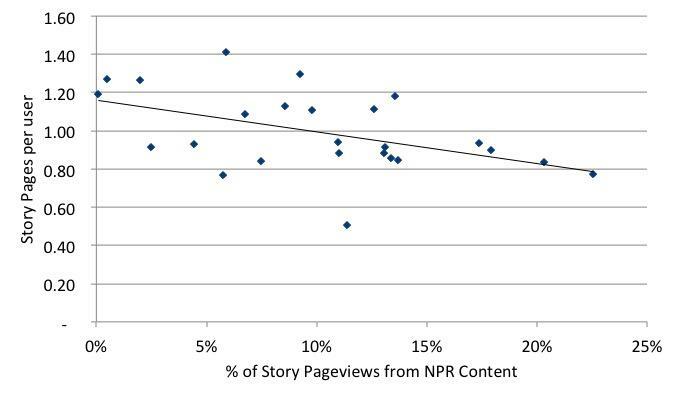 Stations with a larger percent of traffic from NPR stories see lower user engagement overall. We see this clearly when we look at overall user engagement with stories - measured as story pages per story reader. In the graph below there is negative relationship with the percentage of pageviews from NPR produced content. This implies that locally produced content encourages users to engage more with additional stories on the site. A well written and informative piece about local issues can help the user to identify the station as a great source of information they can look to for more. Stations who include too much NPR content might be lowering the overall user engagement, because users see information they can also find somewhere else. We also wondered if NPR content might be useful to add depth and keep highly engaged users around for longer by giving them content that they might be likely to look for on other more nationally focused news sites. 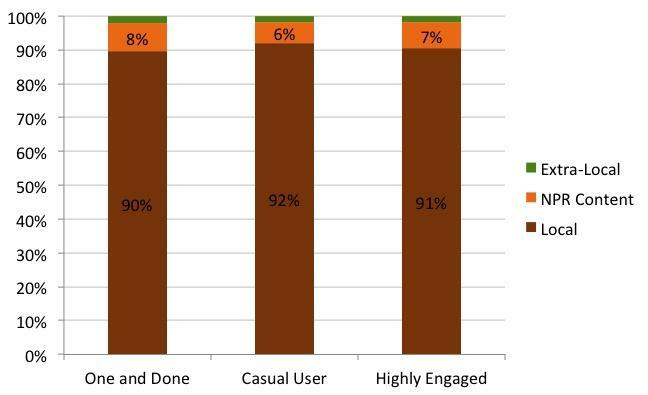 Highly engaged and local users didn't seem to be consuming NPR content at a higher rate than other users. In fact, whether users visit once ("One and done"), are "Casual Users" (approximately monthly) or are "Highly Engaged" weekly visitors, we saw little difference in that rate at which they consumed NPR stories. In all cases, NPR stories made up around 7% of the total story pageviews. The important points to remember are that local content is more likely to retain new audience. NPR content overall is less popular than local content, but it's a good supplement for casual or highly engaged users who are already visiting the site. We recommend a careful approach to NPR content rather than turning on the fire hose of content that comes from an uncurated API feed. Choosing carefully curated content with specific local relevance has the potential to drastically improve users experience with NPR content. What we don't know is whether the inclusion of NPR content helps to improve brand identity, by more closely associating the station with the NPR brand. It is also important to note that this analysis included larger stations with significant digital news capabilities. For smaller stations that do not have the ability to produce local digital news content, we have seen that NPR stories can help to keep the site fresh and to supplement content produced by the local station. In the absence of locally produced content NPR news is a great option to provide content for local users.